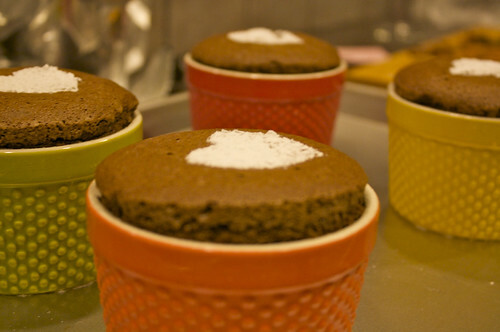 According to ATK, this technique only works for the individual chocolate soufflés, which can be made ahead of time and frozen. The recipe calls for eight 8-ounce ramekins but we found this only works with 6-ounce ramekins. It only yielded about six and a half full 8-ounce ramekins. 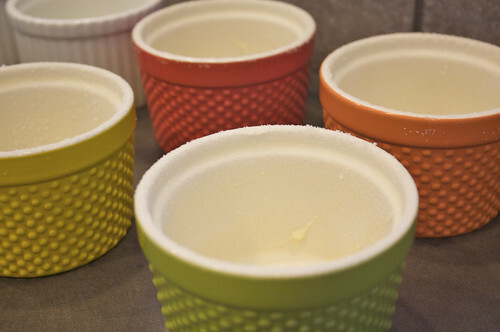 For the ramekins, use about 1 to 2 tablespoons of softened butter and approximately 2 tablespoons of granulated sugar. 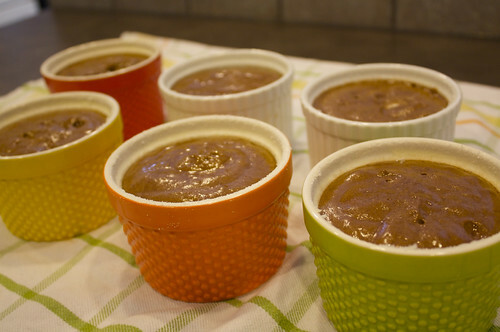 Grease the inside of each ramekin with softened butter, then coat evenly with the granulated sugar. Now, on to the soufflés. 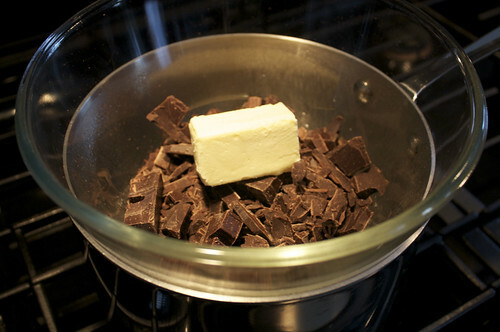 Melt chocolate and remaining butter in a medium bowl set over pan of simmering water, stirring frequently until smooth. Turn off heat, stir in salt, vanilla, and the liqueur, then set aside. Using an electric mixer, whip the egg yolks and granulated sugar at medium speed until the mixture triples in volume and is thick and pale yellow, about 3 minutes or so. If you’re using a hand mixer, it will take about 8 minutes. 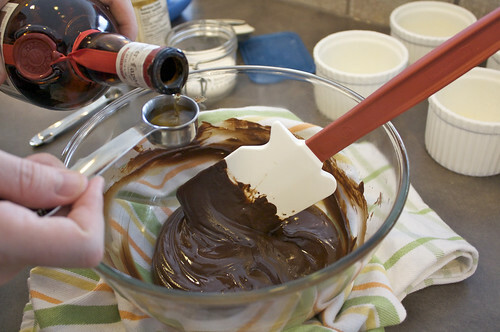 Fold the yolk mixture into the chocolate mixture. After this step, it is very important to make sure the mixing bowl and beaters are thoroughly clean. 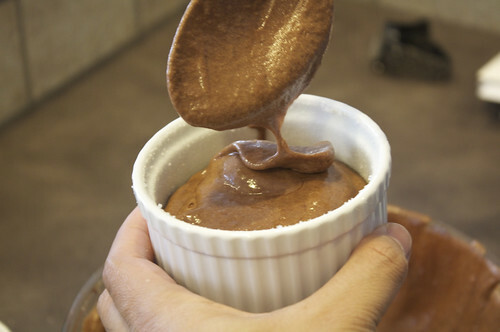 Fold until yolk mixture is fully incorporated with chocolate mixture. Using clean beaters, whip the egg whites at medium-low speed until frothy, 1 to 2 minutes. Add the cream of tartar and increase the mixer speed to medium-high. Whip until soft peaks form when the beaters are lifted, 1 to 2 minutes. 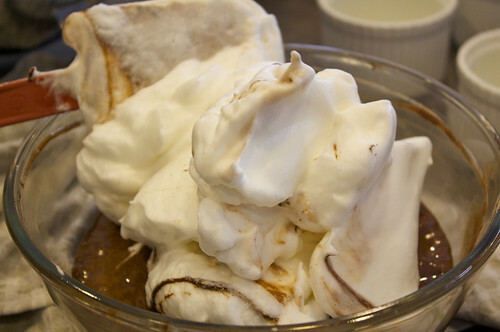 Add the confectioner’s sugar and continue to whip until stiff peaks form, 2 to 4 minutes. (Do not overwhip. If necessary whisk the last few strokes by hand, making sure to scrape any unwhipped whites from the bottom of the bowl. 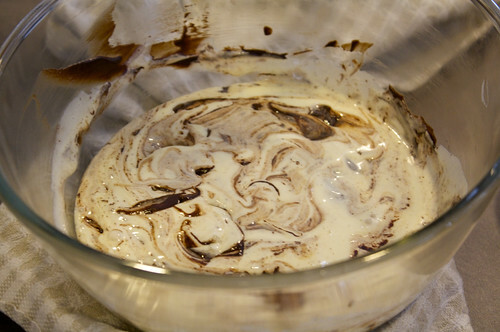 Vigorously stir one-quarter of whipped whites into chocolate mixture. Then gently fold the remaining whites into mixture until just incorporated. Starting at the top of the bowl, use the spatula edge to cut through the middle of the mixture. Turn the edge of the spatula toward you so it moves up the side of the bowl. Continue this motion, going full circle, until the spatula is back at the center again. Follow this procedure a few more times, turning the bowl a quarter turn each time. Finally, use the spatula to scrape around the entire circumference of the bowl. Fill each ramekin almost to rim, wiping excess filling from the rims with a wet paper towel. 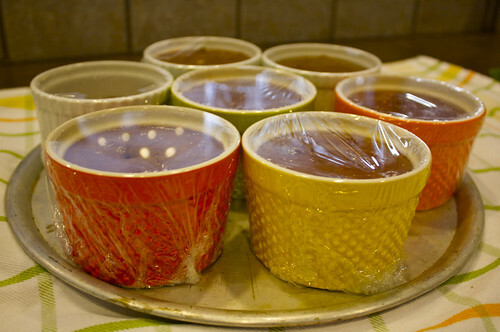 If not being served immediately, cover each ramekin tightly with plastic wrap and freeze until firm, at least 3 hours. These soufflés can last up to a month but who are we kidding, they were all gone the next day. When ready to bake, do not thaw before baking. Adjust the oven rack to lower middle position and heat the oven to 400 degrees. Remove plastic wrap and spread them out on a baking sheet. Bake until fully risen and fragrant, about 25 minutes. The exterior should be set but the interior is still a bit loose and creamy. 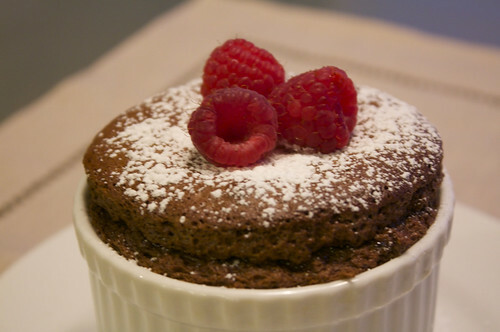 If the soufflés are being served immediately, bake them as directed but reduce the baking time, about 12 to 15 minutes. 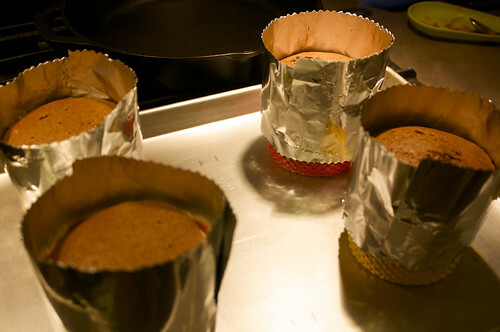 You can also place a foil collar around the ramekins to soufflés rise higher and have a flat top. Secure a strip of foil that has been sprayed with vegetable oil spray around each ramekin so that it extends 2 inches above the rim. We used tape to secure the foil collar to the dish to prevent it from slipping. I should say though, the first time we made these for Valentine’s Day, we thought they were done already and took them out of the oven. However, after removing the foil collar, we noticed they have not fully risen yet. Just the same, we served them and they were still delicious. The inside was like a warm chocolate mousse. If you want to check for doneness, use two spoons to pull open the top and peek inside. If not yet done, place back in oven. Keep in mind that you have to time these babies if you intend to serve them right after dinner. Soufflé will not wait for anyone so it has to be served immediately. 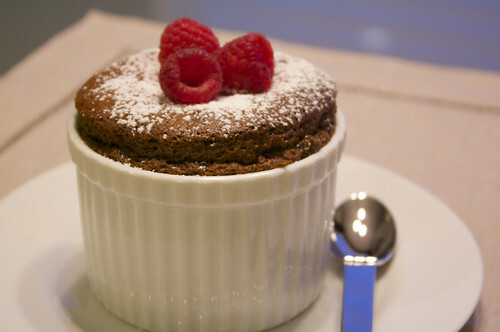 Update: I found a video of Christopher Kimball and Bridget Lancaster from America’s Test Kitchen making these soufflés. This entry was posted in Food & Drink and tagged chocolate, dessert, make-ahead, ramekins, soufflé. Bookmark the permalink. Post a comment or leave a trackback: Trackback URL. Divine! Just like in the food magazines! Thanks! If only that were true… I still have a long way to go with my photography skills. Thank you for your illustrations! They are in the freezer right now – ready to be baked tomorrow night! A quick correction: I believe 1/3 cup granulated sugar is actually 2 1/3 ounces (2.37), not 2 1/2. Thanks again! Thanks Kendra for dropping by and also noticing the error. I corrected it right away! I hope to hear from you tomorrow on how they turned out. How does it turn out when the recipe is doubled? Hi Carol! I’ve thought about doubling the recipe before but after making it the second time, I decided not to go for it. First, it wasn’t possible (for me anyway) since I would need a bigger mixing bowl to accomodate the large volume of whipped egg whites. Also, I don’t have a bigger container to mix the egg whites with the chocolate mixture. As you can see in the picture, once mixed together, the entire mixture fills up a large bowl. Hi, I baked this recipe last night for my boyfriend on Valentines and it came out great! I also followed closely the entire egg yolk in syrup sugar directions in the video you posted. Thanks for this great recipe…+I love your colored rameskins as well:)! Thanks Eliza for commenting. 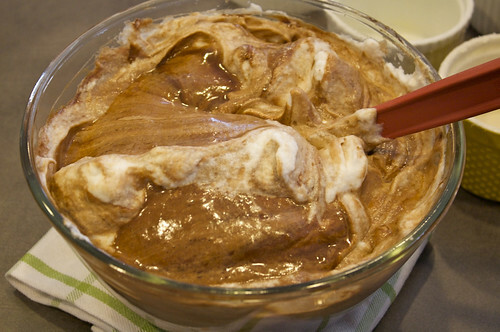 You can use the same sugar syrup when making frosting with egg whites or even making buttercream. I love the coloured ramekins. I’m happy we got quite a few of them as I can’t find them anymore.